As you can see in the pic above, i bought a carmex tinted lip balm. I am a huge carmex fan but this one did not convince me. The vanille scent was way way to strong and it was not as moisturising as the normal carmex. I picked up quite some Real Techniques brushes in the black friday sale. It was buy one get one for free. I did not own any real technique brushes yet, so i picked up the core collection which comes in a super handy travel case. I then still added a big powder brush (i just looove big powder brushes) and a foundation buffing sponge (i had seen those several times in use and just had to give this a shot). The sponge has become since purchase a holy grail product. This sponge makes my foundation look like just my skin but perfect. I have never seen a brush do that with this ease and speed. It is amazing. the only thing i do not like is that i do not really manage to get it completely clean anymore. I wash it out with baby shampoo and it smells all fresh again, but the discoloring from my foundation stays. Also, i have to hide this very well from Eddy the cat who already took of with it twice after digging it out of my make up kit. 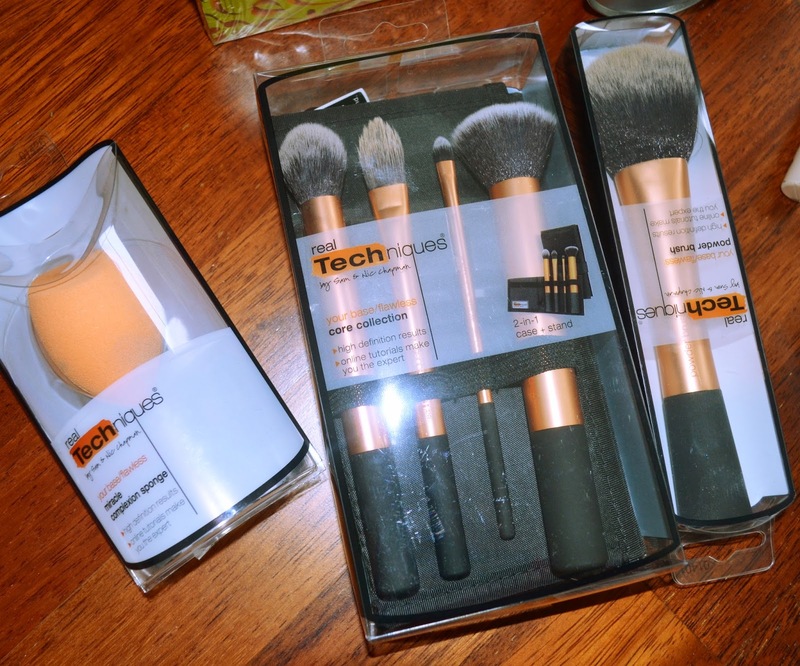 The Powder brush also does a really great job and its sooooo soft. My second favourite brush is probably the contouring brush. But i have to say they are all pretty great. So happy with those purchases. The second purchase i would like to show with you is those two Rimmel lip products. I heard a lot about Rimmel Apocalypse beeing so great and having a great staying power. I have to say while i loved how this product looked just after application, it did not stay a lot longer then any regular lipgloss with me. So its a nice enough lipgloss but i do not really understand the hype. The second one was a recommendation by Essiebutton. The Rimmel London Provocalips. This product is amazing. I bought mine in a hot red and i wore it all day in London and another time all day in Germany for a christmas market tour and it lasted. Not even eating would damage this perfect red lip. And at the same time, it was not drying out my lips at all. What is this magic? I actually have to remove this in the evening and it removed perfectly easy and residue free. I love love love this product and i will definitely look into getting more colors. I really wanted to try the Tanya Burr products since i had heard a lot of great things about her lipgloss and also i was just super curious about her make up since she is a make up artist. I purchased the lipgloss in "afternoon tea" and the nail polish in "peaches and cream". I have to say i get the hype arround the lipgloss to some degree. this lipgloss does not give a strong lip color but it is like an instant lip booster. At the same time it is really moisturising. It has the normal lip gloss problem of not lasting very long but as moisturising as it is, it should be no problem to reapply. Unfortunately, Eddy got a hold of it and threw it off the table and it broke. I was able to fix it that way that i can still use it but i cannot transport it anymore :( . The nail polish really suprised me. The colour is quite nice though not my absolute favourite, but its lasting power was amazing. Even though i was using my nails to open packaging and i was out and about all day in London, this nail polish lasted and lasted and lasted. It is the longest lasting polish i have worn so far. So i am actually exited to get different colours from this. All in all i was really suprised by the Tanya Burr products. I was expecting something mediocre which lives of the name and got two really great new items which i will keep using. I also picked up a benefit sample gift set and also a simple skin care sample gift set and obviously a collection lasting perfection concealer (OMG). I might put up more reviews as i start using this products more. The collection lasting perfection concealer is amazing but i think you all know that already and i did not want to bore you with yet another raving review about this holy grail product. All in all, shopping in London is amazing and suprisingly affordable. The prices were not any higher than in Belgium. In fact it was cheaper in London. I am already planning to return. I still have a long wish list especially for the more high end products. I feel so blessed that i finally got to try out all of this products i had read so long about.